Oil and Gas UK chief executive Deidre Michie OBE was guest speaker at the social enterprise’s awards night at the Double Tree by Hilton Treetops Hotel in Aberdeen. With a theme of the Energy Future of the UK, she highlighted the positive outlook for the energy industry while noting the continued need for the sector to promote diversity and inclusivity. AFBE-UK Scotland is a not-for-profit organisation that encourages young people, particularly those of black and minority ethic (BME) origin, to consider a career in science, technology, engineering or mathematics. Denis Pinto, an oil and gas industry professional for more than 30 years, was given the Special Appreciation Award. The flow measurement and hydrocarbon allocation consultant has helped others through his many roles including those at the Federation of Small Businesses and the Energy Institute. Shell UK won Company of the Year and Claire Hayward, of BP, won the Outstanding Mentor Award, while WSP telecommunications engineer Samuel Elegbede landed the Young BME Professional of the Year honour. Sarah Weihmann, a PhD researcher in structural geology at the University of Aberdeen, was recognised as AFBE-UK Scotland Member of the Year for her commitment at the organisation’s events to encourage the next generation of engineers. 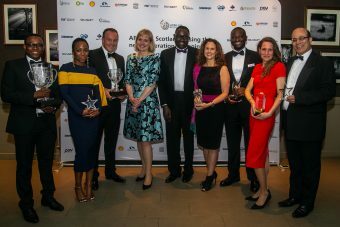 Dr Ollie Folayan, chair of the AFBE-UK Scotland, said: “We’re delighted with the success of our first awards to celebrate diversity and inclusion for under-represented groups in the oil and gas and engineering sectors. The night included a recitation by Anuli Marshall and a performance by Aberdeen Bhangra Crew. Dr Nike Folayan, sister of Ollie, and chair of London-based AFBE-UK also spoke at the event. Ollie and Nike were part of an AFBE-UK group that recently met Nero Ughwujabo, special advisor to the Prime Minister Theresa May, to showcase the work the social enterprise does to highlight opportunities in STEM. The event was hosted by award-winning radio and TV presenter Lady Tolu, while The Nevis Ensemble, The Gentlemen of Jazz and DJ Mike Ife provided the entertainment for the evening. Funds were also raised on the night for the Music Hall Transformation (MHT) project. OGIC chief executive and chairman of the Society of Petroleum Engineers (SPE) Aberdeen Section Ian Phillips, one of the judges at the AFBE-UK Scotland Awards and also the chair of the Offshore Achievement Awards, invited all finalists to apply for the Young Professional of the Year Award that will be presented in March 2019. The AFBE-UK Scotland event was supported by Oil & Gas UK, the Energy Institute; Society of Petroleum Engineers (SPE) Aberdeen Section, Royal Academy of Engineering, Shell UK, Schlumberger and BP. AFBE-UK Scotland has supported more than 1,000 people – from youngsters to industry professionals – through a series of Aberdeen events that have included senior managers engaging with primary pupils, to talks by oil and gas industry leaders.